The Huawei Ascend P6 has an 8MP camera for maximum image resolution of 3264 x 2448 pixels. There's a single LED flash to go with it. The camera interface looks pretty standard - you get a still/video camera toggle, a virtual shutter and a shortcut to the gallery on the right. The fun stuff is on the left side though everything is hidden in the advanced menu. The only two shortcuts you get are for a switch for the front camera and flash options. From the advanced menu you can choose between Single, Smart, Beauty, HDR, Panorama and Effect modes. The additional settings shortcut is also here. Digging deeper into the settings you'll find object tracking, smile shutter, touch to capture switch, geo-tagging on/off, ISO, white balance, etc. We don't find this convenient and we definitely liked the old Huawei camera UI better. The Volume Up key doubles as a hardware camera shutter inside the camera app. You can hold it to focus and it will take a picture upon release. The camera offers excellent levels of fine detail and manages to keep the noise in check. We've certainly seen better performing cameras in terms of noise levels, but these are acceptable. The colors are nicely saturated and the exposure is reliable, too. One thing to watch out for is the autofocus accuracy - we had several shots (more than usual, actually) which were out of focus. Just like with the Ascend Mate's samples, the P6 photos have quite soft corners, pointing to somewhat inferior lens quality. That's not that surprising; we've seen the same issue in the Samsung Galaxy S4 mini as well and it might as well be an isolated unit-specific case. Check out these HDR shots too. Keep in mind that you have to have a steady hand for those two to work properly. Unfortunately, steady hand or not, the results are far from impressive. And here is a panorama sample. Note that the Ascend P6 is capable of taking 360-degree pano shots. The stitching is great, but it takes about 10 seconds to complete. Huawei's front-facing camera snaps photos of 5MP. It's a fixed focus snapper but it's perfect for portrait shots you want to post to Facebook or other social network. It offers Beauty shot (skin smoothing effect) and Instagram-like color effects too. The synthetic resolution chart shows excellent results that can rival the best in the 8MP range. The noise-reduction is well-behaved, while white balance is quite accurate in artificial lighting. There's very good detail (and some oversaturated colors). 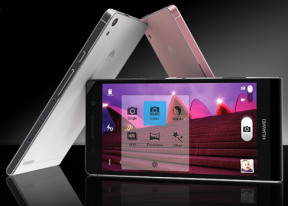 The Huawei Ascend P6's main camera records videos at up to 1080p@30fps plus 720p HDR videos, while the front facer is good for up to 720p@30fps. The camcorder interface is practically identical to that of the still camera. You lose the color effects option, but you can still enable the face effects. Videos are MP4 encoded at a bitrate of about 25Mbps for 1080p videos. There's stereo sound and the 30fps mark is consistently met. We really aren't pleased with the video quality and that ruined the nice impression from the still camera. The corner softness was way more evident on the videos compared to the photos and the videos are quite a bit more oversaturated than we would like. The framerate is smooth, but even in the sharpest central area, the level of resolved detail is not as high as it should be. The HDR videos look somewhat darker than their originals and loose contrast, but unfortunately don't bring any more detail that wasn't already available in the standard mode. We guess Huawei need to work on this department more. Here are is a 1080p video sample we've uploaded to YouTube. If you want to look closer at the video quality, you can download the untouched 1080p@30fps sample. The Huawei Ascend P6 qualifies for the 1080p competition that's going on in our Video Compare Tool. The results are on par with the Huawei Ascend Mate and much better than Samsung's Galaxy S III.